Community organisations representing more than five and a half million people around the world have united to take joint action and express global opposition to the Trans-Pacific Partnership, as Trade Ministers sign the deal at SkyCity in Auckland. 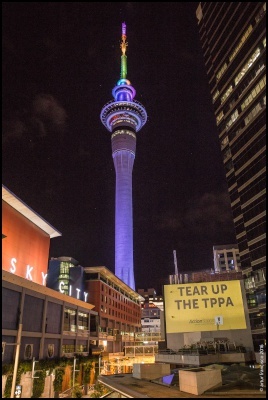 ActionStation (New Zealand), Leadnow.ca (Canada) and SumofUs covertly projected visual protest images near the Auckland SkyTower where the signing ceremony took place earlier today. A second and third projection could be seen from various motorways as you entered Auckland CBD. Leadnow.ca Campaigner Brittany Smith said “We want to show governments that while they’re signing the TPP, we’re building our movements to oppose it – and we’re only getting stronger. People coming together across borders to voice mutual opposition to this dangerous, costly and outdated deal is the true “trans-pacific partnership”.